Victor Gama, composer, performer and instrument maker, on a photograph of a child playing his Tipaw instrument. GB Tell me why you chose this image. VG I chose it as I think it portrays how beauty manifests itself through a combination of elements, in this case, the boy, the musical instrument and the room, all coming together at that particular moment where the mallet hits the bell and a sound is produced. GB Your instruments bring together two worlds that don’t often meet – the ancient and the cutting-edge. They look so organic. Do you find that people view your instruments differently when they find out that parts of them are fabricated digitally? VG Musical instruments have up to now been either physical or digital, with a major shift in paradigms happening in the last three decades. What I am proposing with the Pangeia Instrumentos series is a method of composition where the composer moves beyond writing for pre-existing fixed design instruments, to instruments that derive from symbolic elements that define the piece. 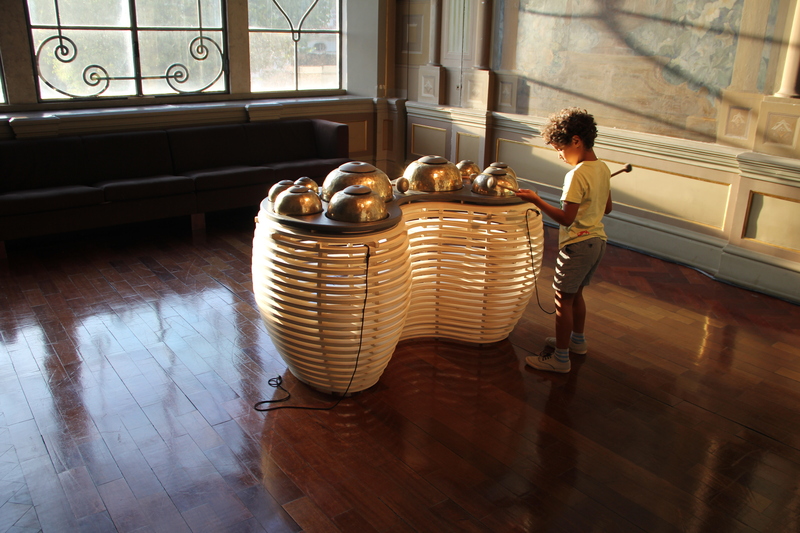 This means that the instrument has to be designed using 3D modeling and made using digital fabrication techniques with old and new materials in order to create the piece in a reasonable time frame. What happens is that the instrument becomes a symbiotic interface between the conceptual domain of the piece and the composer. The resulting music is impregnated with a kind of personal mental chart of the whole creative process, manifested in the instruments that have been created. In this case instrument and score are one. They look very organic because they contain meaning, charged with a mythical substance. Composers, like writers, are myth makers, universe creators – and that’s where the cutting edge has a chance to meet the ancient or the primeval. This is the origin of musical instruments. A guzheng represents a dragon flying through the skies and its design is informed by that mythology. I depart from the digital eventually – by designing in 3D, testing in the digital domain and fabricating using all kinds of digital fabrication technologies such as CNC, laser cutting, 3D printing – to create a physical instrument that can be performed live. The shift in paradigm happens because this new instrument carries a shadow of itself, a double that exists as a virtual instrument or digital self, that results from it having been created in the digital domain. The composer and musicians now have the ability to control more parameters then ever before, merging the physical and virtual versions of the instrument in real time. People who experiment with my instruments through my concerts or exhibitions, where they have a chance to try them freely, usually suspect that this is happening behind the scenes, but it takes a talk or workshop to fully understand it. GB Do you think that nature is more beautiful than anything that can be created digitally? VG I think beauty is an illusion, a fabrication of the mind. Nature doesn’t see beauty, we see it and thank the gods we do, but what’s beautiful for me isn’t necessarily for you. Humans can now live in virtual worlds created digitally, without ever coming into direct contact with nature. Nature is dying for many humans, and this is causing a major impact on our planet. GB Is beauty something that you aim for digitally and sonically – or do other parts of the aesthetic experience come first? VG I like narratives to structure my pieces and, like most narratives, they have beauty and drama, sadness, melancholy and happiness, joi de vivre, death and love, rage and fear. All of these are generated with the aim of communicating a particular message. My new piece 3thousandRIVERS, a multimedia opera that is still a work in progress, is aimed at communicating a reality that most people can’t see, which is the inevitable destruction of our planet’s rain forests. People don’t see the destruction because it’s too big to see. I am working in Colombia with local non-governmental organizations, community leaders, musicians and shamans in Amazonia. They all comment that we have to find new ways to communicate what’s happening in terms of deforestation, mining and drilling, burning and polluting, displacement and killings, mass extinctions and the perishing of ancestral cultures and knowledge. Music has the power to pierce indifference and move hearts and that’s probably where beauty happens. GB You bring technology and an African influence to the Western music tradition. Do you find that some people have problems with this aesthetic? VG Yes, unfortunately some people, particularly in Europe and America are still clinging on the old preconceived ideas about African culture, actively refusing to accept that Africans are not and have never been the way they have been portrayed for many centuries. Because of this most people can’t accept that African composers and musicians produce contemporary music, experimental music, electronic dance music and a wide array of new styles that come up every year or every decade. I’m afraid that many of these people are still open to racial profiling and I could tell you many stories where this has occurred to me because I don’t fall into what they believe is the right category for an African composer/musician. GB How do you feel about purists who want their baroque music played on original baroque instruments? VG I think that’s great because it’s a way of keeping that knowledge alive and the instruments in the hands of performing musicians instead of just in the museum. GB In Angola, where you’re from, there are still Pentecostal churches that associate musical instruments with the devil. How do you think this came about? Do you think that these people can still sense beauty in instruments and music in spite of the imagined evil? VG This is a recurring phenomenon that has happened in the last three decades in Angola and many other countries in Africa and the Americas. In fact these churches originated in the US, spread to Brazil and are now contaminating the whole social fabric in these countries with an extremist evangelical ideology aimed at instigating fear and dominating people, who subsequently support them with a tenth of their hard earned salaries. It’s a business with the worst ethical standards. They expect people to abandon all beliefs in their own religions and traditions and destroy or even burn cultural objects such as musical instruments. This happened during colonial times for centuries and is now coming back in full swing. GB You work with children a lot and you’ve chosen a picture with a child in it. Do you like to work with children because they are more instinctive and have fewer associations with musical traditions? VG Yes, definitely. Children are spontaneous experimenters. They can come up with the most amazing ideas in a flash of creativity that we adults rarely have. When we do, we create masterpieces. I really believe that if we want to change our world and make it a less violent and hostile environment, we all need to work with children. A child with a musical education and an instrument at home or at school will never think of holding a gun at someone’s head. The same goes for sports, maths, philosophy, fun and games – but music has something special about it. GB Have you seen experiments that show how even professional musicians can’t tell the difference between an original Stradivarius and a violin that was made last week. Do you think we need to learn something about our relationship to instruments from this? VG I saw that article last week but I disagree. It is well known that wood develops special resonating characteristics with time. A violin with three hundred years is definitely not the same as a violin made with wood that was cut recently. VG A piece of music performed by a master musician playing a Stradivarius violin. Hi. Just curious, but with so many things the journlaist/ author could have asked about, why specifically the question about the pentecostal churches? It is an interesting phenomenon that I was not aware about (burning musical instrumnents), but why did this come up in the interview? Hi Rui – thanks for your question. I’d read an interview with Victor about his Angolan background where he’d mentioned this. Many of his instruments are based on old Angolan designs and I was fascinated by the idea that something so beautiful could be considered evil.